Railpictures.ca - Doug Lawson Photo: Some CR Blue & White, some BCR two tone green as well as silver and blue. Conrail 7774 far away from home working as yard engine in William Lake BC. BC Rail was short of power and scrounged up a few Conrail units. The story I heard was that the CR units had been leased to CP Rail and then rented out to BC Rail. The units were in rough shape mechanically and spent most of their time dead and awaiting repairs, needless to say BC rail did not keep them long. Sorry I can’t pin down a date for this image, most likely mid-1986, the cheap slide film that day did not process with a date stamp. | Railpictures.ca – Canadian Railway Photography – photographie ferroviaire Canadienne. Caption: Some CR Blue & White, some BCR two tone green as well as silver and blue. 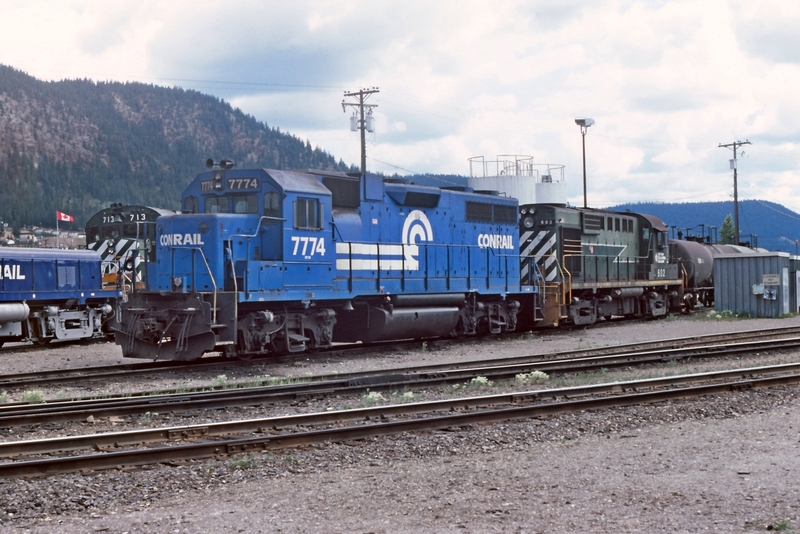 Conrail 7774 far away from home working as yard engine in William Lake BC. BC Rail was short of power and scrounged up a few Conrail units. The story I heard was that the CR units had been leased to CP Rail and then rented out to BC Rail. The units were in rough shape mechanically and spent most of their time dead and awaiting repairs, needless to say BC rail did not keep them long. Sorry I can't pin down a date for this image, most likely mid-1986, the cheap slide film that day did not process with a date stamp. Probably after August 1986. The seven former Kennecott Copper SD40 (101-107) went from CP lease to BCOL in 9/86, leased and then purchased becoming 736-742.